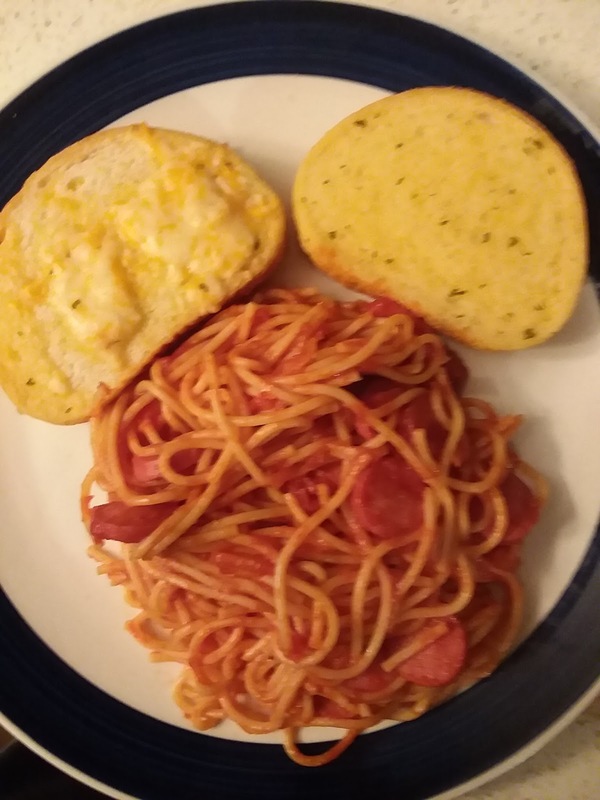 ga('require', 'GTM-KQZ8X5J'); Emeril Lagasse hot dog spaghetti my style. 5. While hot dogs are frying add water in a pot for spaghetti noodles once water for noodles is boiling take out hot dogs and set aside add garlic to the skillet and let brown.add noodles to boiling water. 6. As noodles are boiling. Start sauce. Once garlic starts to get brown add tomatoes paste and stir it in with the garlic let cook for a minute then add in your blended tomatoes and water mix let simmer if you want your sauce thick don't add a lot of water but if you want it more wet add more water. Do to your liking once noodles are all most ready add onion and hotdog to sauce add red pepper flake salt and other seasoning you like. I used oregano and some garlic salt. Drain noodles and server. You can place sauce on top of noodle or mix all together. And enjoy.